ZeOncoTest is aimed at perfecting a cheap, fast and reliable personalized oncological test that will determine the best possible treatment for every individual cancer patient. 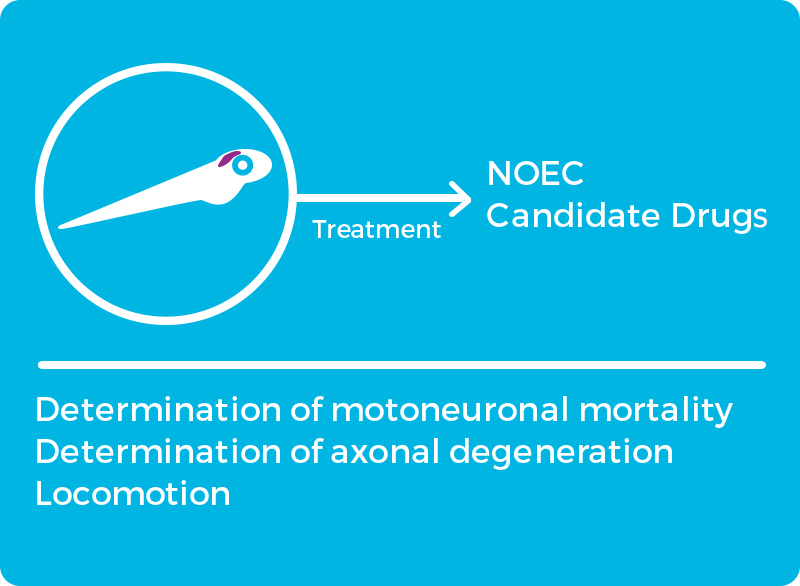 The ZeOncoTest uses zebrafish embryos as xeno-hosts for human cancer cells in order to assess the capability of those cells to grow and metastasize under different chemical conditions in an in vivo environment. The product is based on our own research and a broad range of scientific precedents. The ZeOncoTest idea is to transplant primary tumor cells, coming from a cancer patient, into zebrafish embryos. Then, grow these transplanted embryos under the whole range of possible treatments for that cancer type. In only a few days, and after careful image and statistical analysis, the ZeOncoTest will provide enough information to help the medical team to decide, with a greater chance of success, which of the available treatments is the most suitable to prevent the growth and metastasis of this specific patient cancer. As stated before, finding the correct treatment from the beginning of the diagnosis will increase enormously the rate of survival and decrease the time of recovery, with its associated suffering. But, also the resources spent during the healing of a cancer patient. In parallel, the ZeOncoTest can be used by pharmaceutical companies, including ZeClinics, as an efficacy tool for drug discovery in oncology field. Moreover it can be applied to late phases of drug development to identify the potential sub-group of a given tumor type and accelerate the process of acceptance of new anti-tumoral compounds. ZeClinics has become the most successful scientific crowdfunding campaign from the year 2015 in Spain. After a campaign of 88 days in the Capitall Cell platform, the project received 100.000€ from 64 different investors. Inflammation is a vital part of the body’s immune response. It is the body’s attempt to heal itself after an injury; defend itself against foreign invaders, such as viruses and bacteria; and repair damaged tissue. Without inflammation, wounds would fester and infections could become deadly. However, inflammation can also be problematic, though, and it plays a role in some chronic diseases. The aim of this project is the assessment of anti-inflammatory drug activity using zebrafish larvae. Although none of the existing models fully reproduces the complete spectrum of this degenerative disease, critical aspects of Alzheimer pathology and disease processes can be experimentally recapitulated. Genetically modified animal models have helped advance our understanding of the underlying mechanisms of disease and have proven to be invaluable in the preclinical evaluation of potential therapeutic interventions. 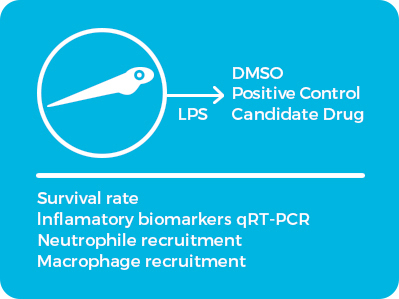 On the other hand, continuing refinement and evolution to yield the next generation of animal models will facilitate successes in producing greater translational concordance between preclinical studies and human clinical trials and eventually lead to the introduction of novel therapies into clinical practice. Following this path, we know that the transgenic line Tg[HuC:Gal4xdsRed:UAS:P301L-MAPT] has specific neuronal expression of a mutant MAPT isoform described previously in zebrafish to promote neurodegenerative phenotypes in larval stages. The zebrafish is an innovative model organism in industry, although its use is spreading as a quick and economical alternative to the mouse during the preclinical phase of drug discovery. On the other hand, in the academy its use is very widespread in the investigation of multiple therapeutic areas, that include the oncology, the psychiatry or the cardiovascular disorders. As for the study of cancer, it has been observed that zebrafish can develop tumors as a result of exposure to carcinogens or genetic mutations. These observations have made the use of this model expand in this field. ZeClinics is developing STEM-ZeOncoTest, a new method of diagnostic for the evaluation of antitumoral drugs, by selective identification of tumor stem cells as the triggering players in tumor growth and metastasis. The project has been granted by NUCLIS 2015 (project number: RD15-1-0114, 71.514,42 € of grant) project co-financed by FEDER fund and supported by ACCIÓ under the frame of Executive Program FEDER Catalunya 2014-2020. The complex nature of pharmaceutical new molecules generation, both in terms of R&D process and regulatory requirements, indicates a huge need for innovative tools/services for optimal delivery to patients of novel medicines in the fastest and cheapest manner. The pharmaceutical industry strives continuously to produce new, safer and more efficacious drugs for unmet needs, evolving different synthesis techniques, expanding numbers of leads for potential drug candidates. However, this abundance has also created a new set of challenges in efficient processing of drug libraries for target validation and toxicity assessment. High-throughput screening (HTS) is thought to be key in handling this flow of new potential therapeutics in a systematic and time-efficient manner. But, there is a strong evidence that in vitro cell-based assays and subsequent preclinical in vivo studies do not yet provide sufficient pharmacological and toxicity data or reliable predictive capacity for understanding drug candidate performance in vivo. The model developed by ZeClinics with specific focus on cell and molecular interactions and physiological parameters improves this situation and helps to determine the corresponding responses to bioactive agents. 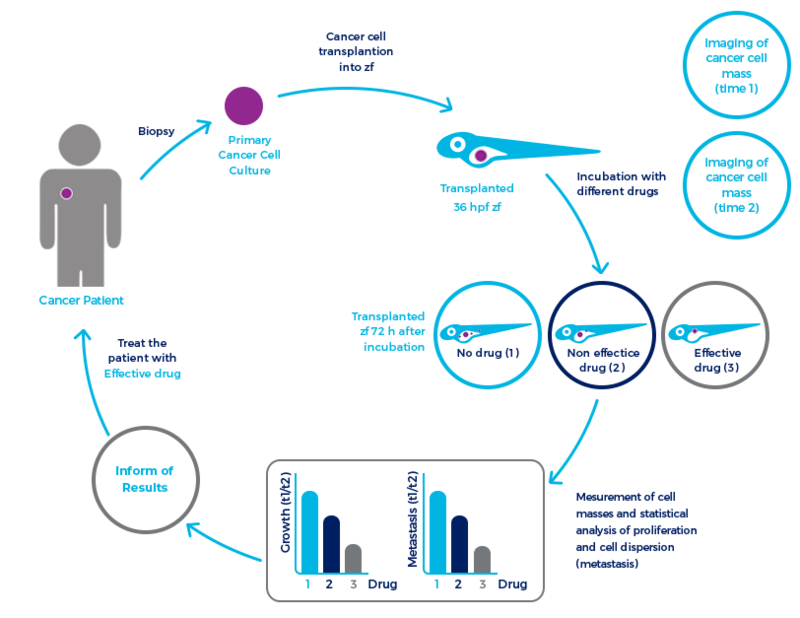 The aim of Cardiotoxicity High-throughput screening project is to use zebrafish model to develop HTS of large libraries in live organism for cardiotoxicity assessment. Our complete system analyses the impact of drugs and diseases in heart performance (Heart rate, Arrytmia, AV Blockage and Ejection fraction) and the performance of the vascular system (Blood flow and vasodilation/vasoconstriction). ZeClinics activity is split into two main branches: the CRO part (Services) and its proper drug discovery program (ZePharma). In 2017 the technological basis and a comprehensive business plan have been prepared for the latter. ZePharma changed the way for the discovery of cardiovascular drugs using its innovative zebrafish model and state-of-the art screening and analysis techniques, therefore performing effective, cost-efficient and fast screening of high-potential molecules. At its core, ZePharma’s founding team holds a deep desire to create an impact on the lives of cancer patients suffering from toxic side-effects of drugs to their heart, patients that suffer from genetic heart diseases, and patients that suffer from cardiac degeneration after acute cardiac damage, because these are avenues for ZePharma to leverage its deep scientific expertise to create a lasting impact on society at large. The development of ZeClinics drug discovery platform was financed by the Centre for the Development of Industrial Technology (CDTI) under the NEOTEC program (project reference SNEO-20161362). The program supports the establishment and development of new technology-based companies in Spain which aim to develop and commercialize innovative proprietary solutions.